The Egyptian film director Youssef Chahine died 10 years ago in July 2008, and the Cinemathèque française, the French national film institute in Paris, has organised an exhibition on his life together with an unusually comprehensive retrospective of his films, made over an immense and more-than-50-year career. The exhibition, running until July next year, draws on material deposited at the Cinemathèque by Chahine or his estate as part of the institution’s archives. In the latter part of his career, Chahine had particularly close links to France, with the French producer Humbert Balsan helping to finance and distribute many of Chahine’s best-known later films, including parts of his Alexandria trilogy of Iskandriya Leh?, Iskandriya Kaman wa Kaman, and Adieu Bonaparte, a recreation of French general Napoleon Bonaparte’s expedition to Egypt, landing off Alexandria in 1798. It begins with items bearing witness to the very earliest years of Chahine’s career in the early 1950s, when the young director, just back from studying acting in California and enthralled by the golden age of Hollywood cinema, was making the first hesitant steps into film-directing, abandoning acting to those he thought better able to draw the crowds to a series of commercially pitched romantic films. The young Michel Chalhoub, a school friend from Victoria College in Alexandria, was an early Chahine discovery, later achieving wider fame under the name of Omar Sharif. Another was the equally young Faten Hamama, playing opposite Sharif in Chahine’s 1954 film Sira fil-Wadi (Blazing Sun), for example, as well as in a clutch of other early films. Chahine’s films from this early period, the first few made even before the July 1952 Revolution, were notable for their appeal to the mainstream audiences of the time, and he drew freely on the talent available in what was then a well-established private-sector film industry for a series of romantic comedies featuring sometimes stock characters and delicious song-and-dance routines. In addition to Sharif and Hamama, various other luminaries of the time acted in these early films, including Hussein Riad, Farid Shawki and Hind Rostom in the first of them, the 1950 comedy Papa Amin, and they appealed to audiences eager for entertainment in Arabic that were perhaps tired of an earlier fare of mostly American films. It was only later that Chahine began to make more socially aware or political films, perhaps influenced by director Salah Abu Seif, one of his most important peers at the time. Later still, Chahine’s career took another turn with a series of films drawing on his own autobiography and largely set in Alexandria, before settling into an eclectic mix of historical films on philosophical or religious themes, often carrying with them a powerful message of tolerance, a return to the gorgeous spectacle of Hollywood musicals, notably in the 2004 film Iskandriya… New York, and films on social and political themes, such as his last film Al-Fouda (Chaos) made in 2007 and seeming to offer a diagnosis of contemporary social ills. The exhibition, divided into overlapping chronological and thematic parts, has much to say about Chahine’s early energy, producing a film a year and sometimes two in the period after 1950, and seeing this as culminating in two new and rather different films, Bab Al-Hadid (Cairo Station) and Djamila Bouhired (Jamila the Algerian), in 1958. The first of these, sometimes described as an early masterpiece and an exercise in social realism that drew attention to segments of the population ignored in earlier films, saw Chahine himself return to acting as Qinawi, a newspaper seller at Cairo’s main railway station who is drawn into a life of crime. The second is a portrait of the Algerian freedom-fighter Djamila Bouhired, who was condemned to death by the French colonial authorities in Algeria during the Algerian War of Independence in the 1950s, but was later released upon the country’s independence in 1962. “Then, Chahine discovered the cinema of commitment… and the decolonisation of the Third World” in the later 1950s in his portrait of Djamila Bouhired, as well as in his epic film about Saladin (Salaheddin), the Kurdish military commander and later Egyptian sultan who retook Jerusalem from the Crusaders in 1187 CE. Saladin is implicitly compared to then Egyptian president Gamal Abdel-Nasser, a leader of Pan-Arabism and a major figure in the Non-Aligned Movement of Third World countries in the 1950s and 1960s, in Chahine’s film Al-Nasser Salaheddin (1963). The exhibition contains many fascinating artefacts from these years, lent either by the Chahine estate or in the Cinemathèque’s Chahine archives, including scripts and publicity materials and the director’s own working notes. However, a new tone is struck after the success of Al-Nasser Salaheddin, funded by the now-nationalised film industry with the support of the political regime, when Chahine was asked to revise his film on the building of the Aswan High Dam, Al-Nil wal-Hayat (One Day, the Nile), since it did not carry the message wanted by its Soviet co-sponsors and was subsequently banned in Egypt and the former Soviet Union. A re-edited version more acceptable to both sides later appeared under the title Al-Nass wal-Nil (People of the Nile) in 1968. “Suffocated by the conformism of Nasser’s Egypt,” the notes to the exhibition say, Chahine left for Lebanon, where he made a musical, Biyaa Al-Khawatem (The Ring-Seller), with the Lebanese diva Fayrouz. 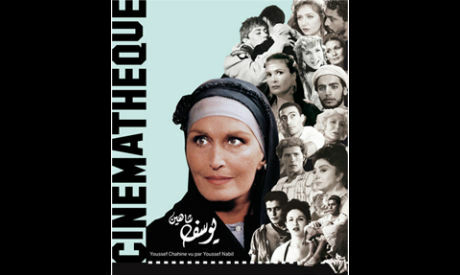 On his return to Egypt after the 1967 War, Chahine began a new phase in his career with a series of more sober films that were critical of the social and political system in Egypt and seemed to have much to say about the reasons for the defeat of Egypt and the Arab countries in the war with Israel. “Chahine wanted to see the problems of society honestly faced up to and to leave behind lyrical flattery or empty patriotism” in a series of films dubbed “the Quartet of the Defeat”, the exhibition notes say. These films, an adaptation of the novel Al-Ard (The Earth, 1969) by Egyptian novelist Abdel-Rahman Al-Sharqawi, Al-Ikhtiyar (The Choice, 1970), Al-Asfour (The Sparrow, 1973), and Awdat Al-Ibn Al-Dal (Return of the Prodigal Son, 1976), are often considered among Chahine’s very best films. In his search for a more independent style of film-making, or one less closely linked to political demands, Chahine was also looking for new forms of financing and distribution for his films, and in 1972 he set up his own production and distribution company, Misr International Films. This allowed him to recruit actors and production-team members who would stay the course of subsequent films, and in the early 1980s, following the success of Iskandriya Leh?, his first autobiographical film, Chahine began the series of Franco-Egyptian co-productions that characterised his work until his death in 2008. This independence, and this honesty about himself — no other Arab film-director, and few in any other tradition, has put himself at the centre of such an extensive series of autobiographical or quasi-autobiographical films — led to further problems for Chahine, however, as the exhibition notes, and not necessarily only from the authorities as had been the case under the Nasser regime. Iskandriya Leh, praised internationally, was banned in several Arab countries, perhaps because its release coincided with former Egyptian president Anwar Al-Sadat’s peace overtures to Israel and because of the film’s overall message of individualism and peaceful coexistence. A later film, Al-Muhajir (The Emigrant), a cinematic re-telling of the story of Joseph from the Old Testament of the Bible and the Quran, led to another form of controversy when Chahine was prosecuted in Egypt for blasphemy following its release in 1994. For those familiar with Chahine’s career, the Cinemathèque française exhibition is an opportunity to be reminded of old favourites through original publicity materials, working notes, and snippets of Chahine’s films. There are also many touching artefacts, including rough lists of telephone numbers, diary entries, clipped-out newspaper articles, photographs of Chahine with various celebrities, and even office equipment taken from the Misr International Films offices in Champollion Street in Cairo, among them a gathering of staplers, rolls of sticky tape (for assembling negatives? ), and a hole-punch. For those less familiar with Chahine’s work, the Cinemathèque has arranged an unusually complete retrospective of the director’s films that includes both restored versions of the major films in what is an all-too-rare opportunity to see these projected on the big screen and lesser-known or rarely seen works including the early films from the 1950s, the Nasserist blockbuster Al-Nasr Salaheddin, and the Soviet-Egyptian co-production on the building of the Aswan High Dam Al-Nil wal-Hayat, apparently in its original version.